A radio collar on B-300, Wolf OR-7’s mother. 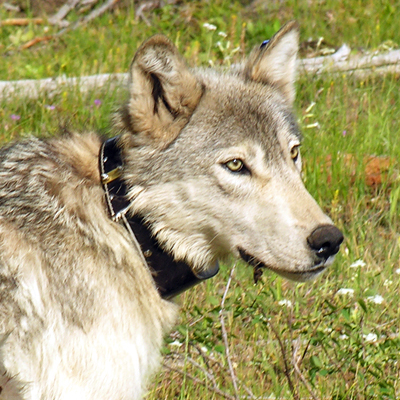 Since the day he was collared in February 2011, Wolf OR-7’s GPS collar sent his position to Oregon Fish and Wildlife officials every few hours. 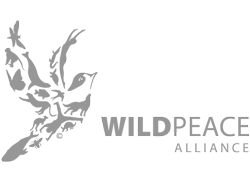 These data points of his exact location are not available to the public, but a map of his approximate dispersal route +/- is available and we did our best to follow along. The batteries within Wolf OR-7’s GPS/radio collar lasted longer than anyone expected, and lost power in 2015. Oregon Department of Fish and Wildlife does not plan on replacing OR-7’s collar. In May 2014, we started our adventure high in the Wallowa Mountains of North East Oregon, close to where Wolf OR-7’s pack claimed their territory. Once we left the Eagle Cap Wilderness, we got on our bikes and cycled towards the Strawberry Mountains. There we had a few days of hiking and tracing OR-7s route. We then took to the bikes again once we were north of Burns, Oregon, and covered 120 miles in two days (what OR-7 did on foot going into the winter of 2011). At Crater Lake, it was time for hiking along the edges of the National Forest lands as we headed south towards the state border with California. Klamath Falls and the surrounding ranches created our next cycle section and took us into the life of local farming communities. Then Lava Beds National Park and Lassen National Forest greeted us, where Wolf OR-7 spent a number of months roaming the woods and the edges of ranches. Our final stretch of the expedition took us around the majestic Mt. Shasta and we made our way west towards where OR-7 continues to roam in the vast forest wilderness of the Cascade-Siskiyou National Monument range.